A rolling pin is a tool used to flatten and shape dough. Traditionally made of wood, the rolling pin has a cylindrical body and two handles. Modern pins feature a central rod, making the tool more efficient and convenient. The first rolling pins were homemade from wood. According to MadeHow.com, the Etruscans are the first civilization known to have used the rolling pin. The height of their civilization was in the 9th century BC. The rolling pin was not much more than a simple wooden cylinder then. Commercial production of rolling pins first occurred in the mid-19th century, according to CroppingCooks.com. Pine had become scarce during this time, so manufacturers began using hardwoods such as cherry and maple to produce rolling pins along with other wooden kitchenware. In the late 1800s J.W. Reed, an African-American Inventor, developed and patented a version of the rolling pin that had a central rod. With this new type of rolling pin, the handles did not spin along with the body; this design is similar to what bakers use today. Rolling pins are made with various materials today. Glass rolling pins are common. Potters make ceramic rolling pins with elaborate carved designs. The classic wooden pin is the most popular. 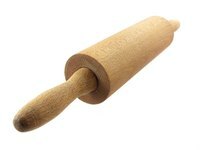 In the United States, 650,000 to 700,000 rolling pins are sold each year.